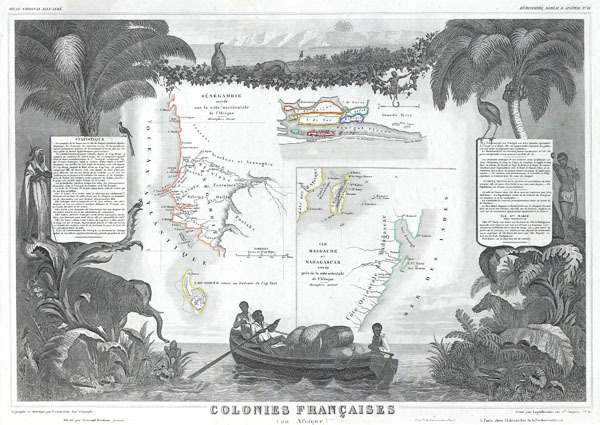 This is a fascinating 1847 map of the French colonies of Madagascar, Senegal, and the Gambia, is divided into two sections: Madagascar and Senegambie. Senegambie features a close up of the Senegal River and the Island of St. Louis. The Madagascar section features an inset of the coast. The whole is surrounded by elaborate decorative engravings designed to illustrate both the natural beauty and trade richness of the land. There is a short textual history of the regions depicted on both the left and right sides of the map. Victor Levasseur (1800 - 1870), an important French engineer, cartographer, and engraver of the mid 19th century, held a number of important cartographically related political and educations posts in France. He is most famous for his Atlas National Illustré des 86 Départements et des Possessions de La France, a large decorative atlas of France, including his Planisphere and five important continental maps. Levasseur's maps are distinctive for their wide decorative margins containing elaborate depictions of the scenery, peoples, and trade goods of the areas he mapped. Levasseur maps are also known to offer a wealth of statistical data. Until recently, very few Levasseur Atlases migrated out of France where they were mostly used in public libraries and town halls. His work represents some of the last great decorative atlases of the 19th century. Very good condition. Wide margins. Rumsey 0427.091. Phillips (Atlases) 3003.